Push-button adjustability, comfort and great control to ensure the right performing components are fully utilized and enjoyed. Helmet, wristguards, knee pads and elbow pads included. 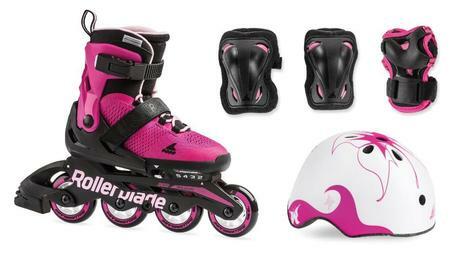 All our kids skates feature a 4 sizes expandable shell. You must refer to the information written on the box to know the size range. To enlarge the skate, press the button and slide the toe box forward. Closures - Cuff Buckle, 45o Strap, laces.